It may still be September but Munich’s infamous annual Oktoberfest celebration is already in full swing. The world’s largest beer festival is back for its 185th year. Many variations of Oktoberfest have popped up around the world over the last few decades, but nothing quite compares to the original festival, held on Theresienwiese, an open space just southwest of Munich. 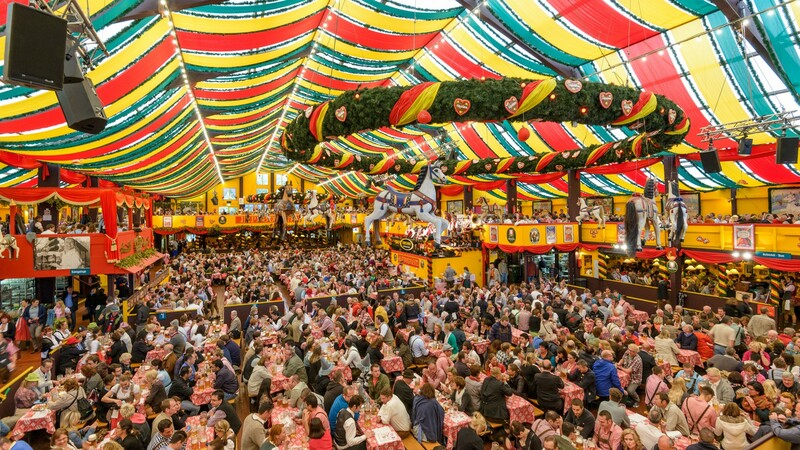 On average, Oktoberfest attracts six million participants each year and over seven million litres of beer are typically consumed during the 16-day-long celebrations. The festival begins with a massive parade of brewer and beer-tend landlords, who make their way through the streets of Munich in horse-drawn carriages and ontop floats before arriving at the Oktoberfest grounds. Crowds then gather in the Schottenhamel tent, the largest of the festival tents, which can accomodate about 10,000 people. At noon, Munich’s major taps the first barrel of beer and yells “O’zapft is!” (it is tapped”) and the drinking begins. While Oktoberfest is best known for en masse beer-guzzling, it’s also a folk festival with parades, music, costumes and other celebrations of Bavarian culture. There are also a variety of fairground rides, with new adrenaline-pumping additions this year called Pendulum of Chaos and the Predator. Festivities will continue until the last keg of beer is tapped on October 7.